BARELY three months remaining to the Paris UN climate summit, Africa still has a number of challenges to address to galvanise itself and remain a force to reckon with at the negotiations. And every effort is being made to ensure that the outcome of the meeting benefits Africans. One way of ensuring that is the hosting of the Africa Climate Talks (ACTs) taking place in Dar es Salaam by the United Nations Economic Commission for Africa (UNECA). The meeting is aimed at discussing the impacts and implications of climate change in Africa and the effective solutions. The conference is a clear signal that Africa is ready to shift from being just a mere spectator at COP meetings to a key player and this will be seen at the meeting in Paris. And Tanzanian Vice president Mohammed Gharib Bilal who opened the gathering warned delegates to ensure the outcome of Paris meeting benefits Africa as opposed to the current Kyoto which has not impacted positively on the continent. The vice president is of the view that a common goal and standing among the negotiators contributes greatly to the likely outcome of the meeting. This is his call for all negotiators to ensure they speak with one voice all the time and avoid being swerved by the industrialised nations. Observations show that the international negotiations to tackle this problem have been embraced by Africa even where there should be reservations. The African continent is the only global region with the greatest proportion of people living below USD2 a day that imposes a cap to consumption opportunities. The ACTs meeting under a theme “The Promise of Paris” seeks to crystalise an umbrella conceptual framing of Africa’s role in the global governance of climate change. The vice president advised delegates to ensure the preparations and vision are crafted from within Africa which can give the continent an opportunity to champion a narrative and consistent aspiration for Africa. Africa is expecting a new global climate agreement outcome from the Paris UN summit at the end of the year. This is because climate change has significant implications for Africa’s development and poses complex and changes for the continent. Although Africa contributes only 3.8 percent of the total greenhouse gas emission, its countries are among the most vulnerable. The continent’s poorer countries and communities will suffer earliest and hardest from the effects of climate change, impacting important climate sensitive sectors such as agriculture. “It is clear that although African negotiators understand the intricacies and complexities, they have in the past faced challenges in their attempt to change any aspect of climate change negotiations,” Dr Bilal said. Dr Bilal observed that the success of COP21 is critical to the post 2015 global climate regime that could keep climate change under control. 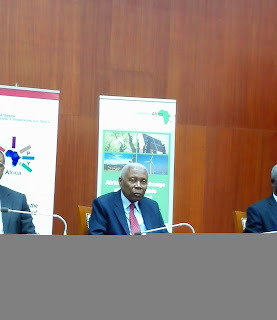 He was optimistic the ACTs conference would contribute to Africa’s preparedness in forging a strategy that ultimately result in a monitoring and evaluation for Africa negotiations. And Vice Chancellor, University of Dar es Salaam Rwekaza Mukandala added that it is unacceptable to let business as usual in climate change. Prof Mukandala stated that “COP21 sets good stance for Africa. It is more important for Africa because this dialogue will result in the agreement that will shape the negotiations. Addressing climate change has become central to the continent’s development agenda. Various policy solutions and actions have been developed and implemented in response to climate change.